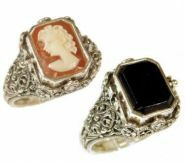 Antique and vintage cameos are highly prized and collectible works of art. 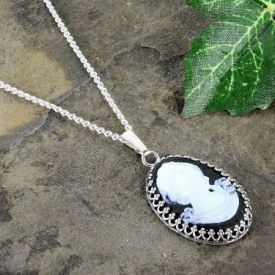 When considering a purchase to start or add to your collection the quality of a fine cameo should be judged by the artistic composition, skill and technique of the carver. 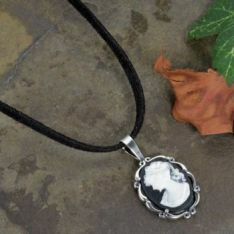 The wonderful thing about antique and vintage cameos is that no two will be exactly alike, each design will take on the personality and life of its carver. This is what makes collecting cameos so interesting and addicting. The cameos I have available span from the mid. 1800's to the 1950's and are set in various precious metals such as gold filled, sterling silver, 10k, 14k and 18k. 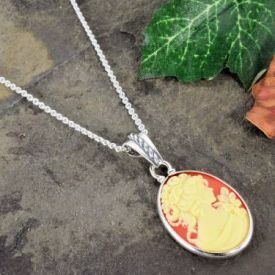 There is also a variety of materials used for cameo carvings, choose from hard stone (Onyx or Agate), Helmut shell (varies from beige to brown), Queen Conch Shell (white to pale pink) and Coral (white, pink, salmon, orange and red). We also offer new cameos that have all the elegance, looks and beauty of the antique ones but at an affordable price point. They make great gifts for all occasions such as graduations, bridal party gifts, bridal jewelry or just because....you love it. 36 Items. Showing Items 1 thru 15. From the 1920's a 10k two tone yellow and green gold pink shell cameo of Ceres goddess of harvest and fertility. The frame is encircled with a seed pearl frame. 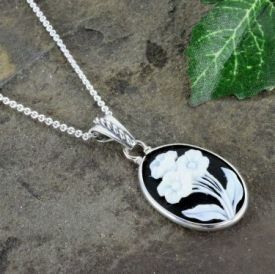 A classic Victorian style 25x18mm white and black colored poly resin floral cameo in a simple bezel frame. Suspended on a roped bail from an 18" chain. 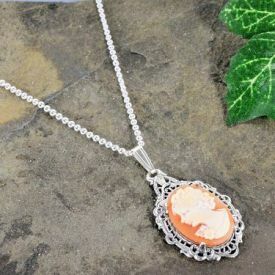 A classic Victorian style 25x18mm ivory and carnelian colored poly resin portrait cameo in a simple bezel frame with a roped bail. Suspended on a roped bail from an 18" chain. 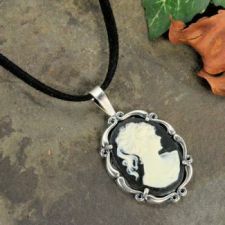 A classic Victorian style 25x18mm white and black poly resin portrait cameo in a vintage designed gallery bezel frame. Suspended on an 18" chain. 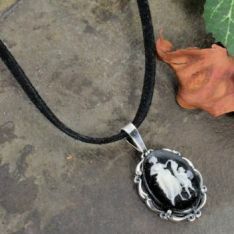 Classic Victorian style 18x13mm small sized white and black poly resin maiden with cupid cameo in a scrolling vintage designed frame suspended on a 3.0mm black suede 16" to 18" cord. 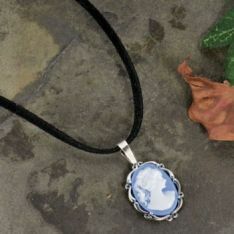 A Victorian style 18x13mm white on blue poly resin portrait cameo in a scrolling vintage designed frame suspended on a 3.0mm black suede 16" to 18" cord. A Victorian style 18x13m white on black poly resin portrait cameo in a scrolling vintage designed frame suspended on a 3.0mm black suede 16" to 18" cord. 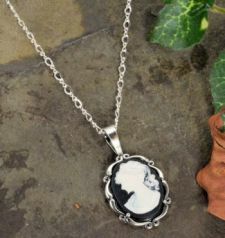 Classic Victorian style 18x13mm white and black poly resin maiden with cupid cameo in a scrolling vintage designed frame on an 18" figure eight link chain. 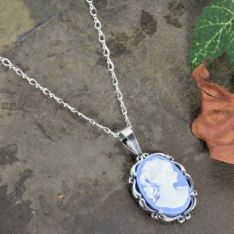 Classic Victorian style 18x13mm small sized white and blue poly resin portrait cameo in a scrolling vintage designed frame on an 18" figure eight link chain. A 15x11mm hard stone cameo in a two tone rose & green gold frame with a left facing Elizabethan maiden. 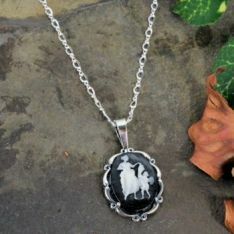 17 x 12 mm cameo carved from (banded agate) sardonyx and white onyx depicting a Roman warrior. 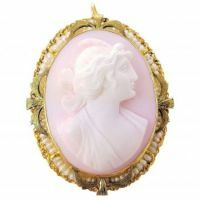 10.5 x 8mm cameo carved from (banded agate) mauve and white onyx depicting a left facing female. Petite in size this ring is perfect for a child or young teen's ring. 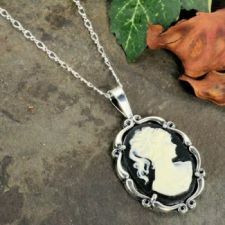 The hardstone cameo of 1930's female profile measures 18 x 12.5 mm carved layers of banded black and white onyx. A pendant and pin set of pink conch cameo carved in high-relief of a maiden with grape bunches & grape leaves in her tresses. 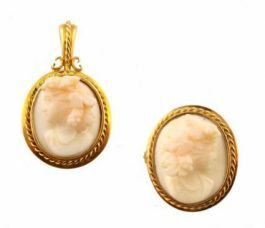 A pale pink conch shell cameo set in a yellow gold wire twist and filigree frame with applied green and rose gold foliage. 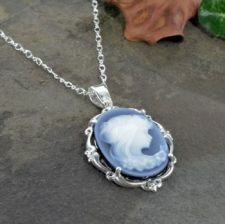 Has a baroque pearl dangle and seed pearl accents.